Garmin and Fitbit are both well-known brands in the fitness tracker market and putting out top-notch products that are worthy of your hard-earned money. But which brand is right for your current needs? Let’s find out in this battle as we put the Garmin vivosmart HR+ vs Fitbit Charge 2! Most people instinctively think of Fitbit when someone brings up wearable tech, but Garmin is also a huge brand in the space. Both the vivosmart HR plus and the Charge 2 are worthy competitors, but is there a clear winner between the two? 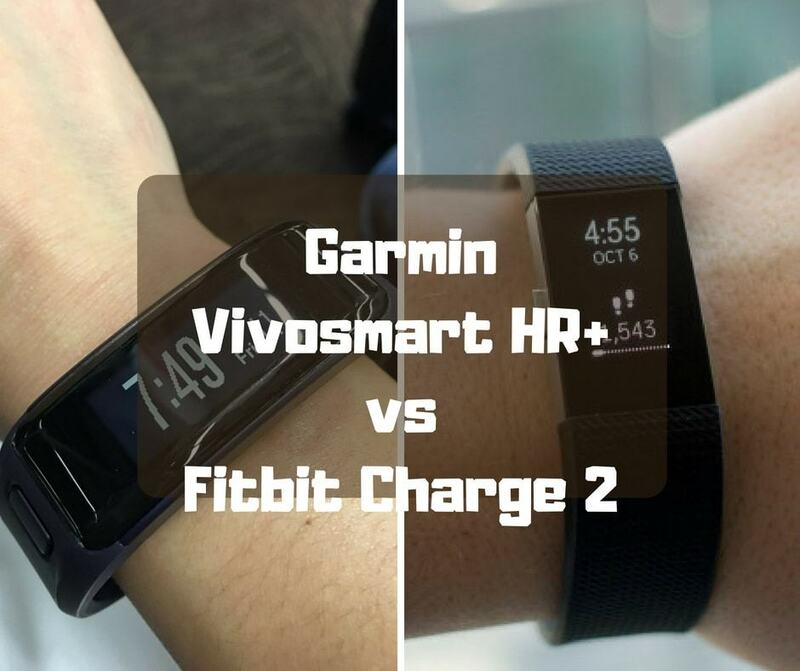 Will Fitbit show it’s might with the Charge 2, or will Garmin step up and take the crown with the vivosmart HR plus? Let’s find out! ​The Garmin vivosmart HR+ is a wonderful fitness tracker. It looks nice, has good battery life, and is chock full of features. It should tick off all the boxes for the fitness fanatics as well as those wanting a more fitness friendly smartwatch alternative. The wearable tech market has been trying to balance “smart” capabilities with fitness functionality to create an all-encompassing product since the beginning. However, that is a difficult task, and for some, the smart aspects are not needed. Garmin decided to take a step towards the fitness side of the line, and this produced the vivosmart hr plus. The real question is, how well does it hold up in a world run by smartwatches and other fitness trackers? Will it be able to throw punches with the top trackers and appeal to the fitness fanatics? Let’s dive into the specifics of the device! The Garmin vivosmart HR+ has a small 1.00 x 0.42” touchscreen display. There is no backlight, so you will be forced to use your surroundings light to see the screen. Don’t expect to use it well jogging at night, for example. The low resolution is not optimal but doesn’t detract much either due to the small size of the screen. The vivosmart hr plus also does not have an interchangeable band. It comes in a couple of different colors for you to choose from Black, Imperial Purple, and Midnight Blue. Not the most choices, but one of the three should suit your eye. The vivosmart HR+ is light enough for all-day wear coming in at only 31 grams. Once you have it strapped around your wrist for a few minutes, it effectively becomes a part of your arm due to it being so light. No worries of arm fatigue here! The two-toned textured silicone band adds a nice visual flare to this fitness tracker, something that is a nice break from the normal single-color bands from the past. If you are looking for something with a bit more aesthetic, this fitness tracker brings it to the table. The only real drawback to the design is it is a bit on the chunky side so that it will bulge off of your wrist a bit. For women that could be a deal breaker, but most men shouldn’t have any issues with it at all. The Garmin Vivosmart HR+ is loaded when it comes to features for a fitness tracker. You could easily name what isn’t included in this package rather than the features that are included. Garmin crushed it with packing features in here: accelerometer, heart rate monitor, barometric altimeter, GPS, and more! If you need it, it is included here. The only real omissions in the features are a lack of dedicated cycling or swimming tracker. However, you can use the open workout option to bypass these omissions. When you pair the vivosmart hr plus with your phone, important notifications will show up on directly on your wrist. It works amazingly well, which means you will never miss an important notification again due to connectivity issues or other bugs. The last major thing when it comes to features is pairing the device to the Garmin Connect app. The app does a wonderful job of breaking down your daily activities into easy to understand graphs. You don’t need to be a rocket scientist to understand your metrics, thus making it easy to identify where you should do more, and where you are in the sweet spot! ​Garmin has given this fitness tracker a super impressive battery life. A rated “up to 5 days” is on the top end of the wearable tech market. You won’t have to worry about charging it constantly, and when you do, a quick charge and it will be back on your wrist where it belongs! 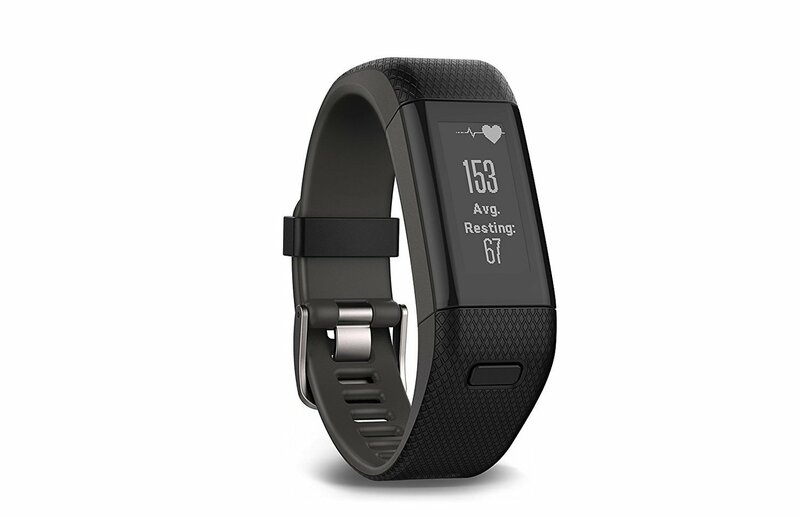 The Garmin vivosmart HR+ comes in at a competitive price in the marketplace. Most people are searching for the sub-$200 market when it comes to a fitness tracker, and this fits nicely in that budget. As fitness trackers get more “smart,” their prices get more and more impressive. Another thing you won’t have to worry about is buying a stylish new band because there are none available. While we consider this a con, it is one less thing you will be inclined to buy so you are likely to save money in the end. The Garmin vivosmart HR+ is a wonderful fitness tracker. It looks nice, has good battery life, and is chock full of features. It should tick off all the boxes for the fitness fanatics as well as those wanting a more fitness friendly smartwatch alternative. One of the main cons that could put off some people, especially women, is the physical thickness of the tracker. With the large heart rate sensor bump on the back, it makes it a bit large sitting on the wrist. Another thing that could put some people off would be the vivosmart hr plus’ lack of band options. With only three color options, it lacks behind many with their selection of interchangeable bands. The last thing worth noting is that there is no dedicated cycling or swimming mode on the fitness tracker. Though it can certainly be worn in the pool with its water resistance rating, the lack of a dedicated mode for swimming and cycling is a bit shocking. It would have been a most pleasant inclusion and would have rounded out the robust feature set well. ​The Fitbit Charge 2 is Fitbit’s bestselling line of the fitness tracker. If you are in the market for a fitness tracker, the Charge 2 should be on your radar. But is this nice piece of wearable tech as good as they claim? Let’s see how it holds up! The Fitbit Charge 2 has upped its game over the original Charge. With a larger 3.8cm OLED display, the tracker feels and looks amazing. The screen is low resolution, but with the small size of fitness tracker screens, it is not a deal breaker by any means. There are also a ton of interchangeable bands available for the Charge 2. If you are all about customization, this could be the fitness tracker for you! From the classic, durable elastomer to the high-end look of the leather bands, there is a style for everyone. While the Fitbit Charge 2 is water resistant, it is not waterproof. This means you will have to take it off anytime you want to get in the shower or go swimming. This is not ideal as many swimmers love to be able to track their activities in the pool. So, if you are a swimmer, this certainly may not be the fitness tracker for you. The Charge 2 is a lightweight, beautifully designed fitness tracker. It has nice lines, a solid build, and bands to fit anyone’s needs. As mentioned before, the bands add a layer of customizability to this fitness tracker that is not available to others on the market. Modestly priced, and of high quality, they are a nice touch to add a bit of stylish bling to your wrist. The Charge 2 is thicker than its predecessor, but that should be expected with the new OLED screen and the features packed into it. It could be a bit of an issue for those with small wrists but shouldn’t pose much of a problem for the vast majority of people. The Fitbit Charge 2 has almost everything you want from a fitness tracker: accelerometer, altimeter, heart rate tracker, and more. Not being waterproof hampers it slightly, and the lack of integrated GPS is annoying at the very least. With other fitness trackers offering GPS, having to tether to your phone to use the phone’s GPS adds a layer that should not exist. The all-day activity tracking works extremely well, giving you a full breakdown of your day by listing things such as steps, heart rate, calories burned, stationary time, and more! Sleep tracking is implemented in the Charge 2, and it does exactly what it says. Tracking your time in all the sleep stages, helping you understand your sleep cycle to improve your overall quality of life. The battery life on the Fitbit Charge 2 is exceptional. Coming in at an impressive 5-day charge-to-charge time, it situates itself near the top of the pile in today’s fitness tracker market. The Charge 2, given its nice OLED screen and feature set, is super impressive in the battery life department. 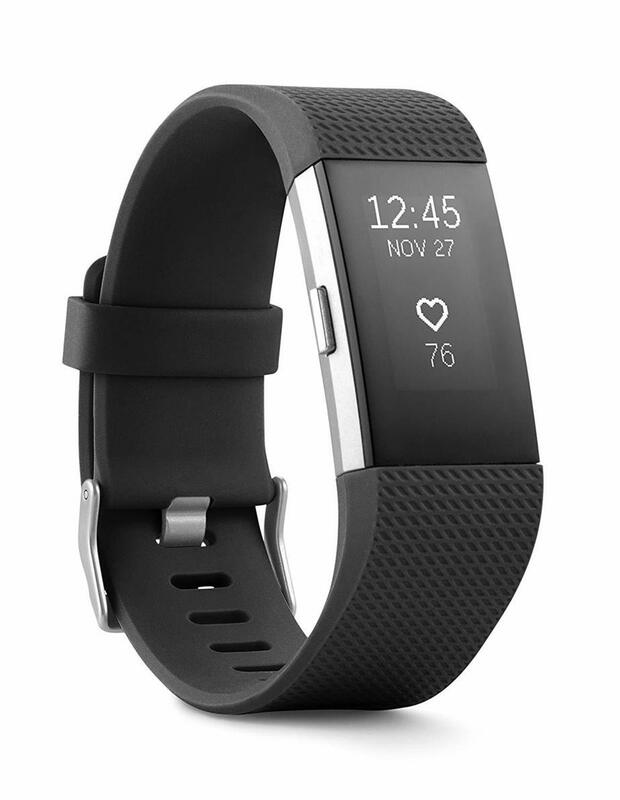 Again, coming in well under the “sweet spot” $200 price, the Fitbit Charge 2 offers a ton of features and a stylish look for an extremelygreat price. If you do not need the waterproof aspect (swimmers, people that can’t be bothered to take them off for a shower), there is no reason not to consider the Charge 2 if you are looking in this price range. The Fitbit Charge 2 has a ton going for it. With an excellent selection of interchangeable bands and nice build quality, for those wanting a nice-looking fitness tracker they can wear in the gym or for a night out on the town, the Charge 2 is for you. Another benefit of the Charge 2 is the OLED display. It is beautiful and large (regarding fitness trackers) and is sharp enough to read everything without any issue. ​The last major benefit of the Fitbit Charge 2 is the long battery life. With a 5-day battery life before needing a charge, it is fantastic for those with a busy life. Why charge it every night? How about every 5 nights? Wouldn’t that be grand? Fitbit, for whatever reason, decided not to make the Charge 2 waterproof. This is an odd choice for a fitness tracker when so many swimmers use them to track their workouts in the pool. ​Another strange omission from the Charge 2 is the lack of built-in GPS. You must have your fitness tracker connected to your phone to use GPS services, as the Charge 2 will. Both the Garmin vivosmart HR+ and the Fitbit Charge 2 are fantastic fitness trackers. They both have pros and cons, and each deserves a look if you are in the market for a new piece of wearable tech. If you are a swimmer or someone who wants to leave your fitness tracker on even in the shower, you will only be able to do that with the Garmin vivosmart hr plus. However, if you want more style and polish, the Fitbit Charge 2 is a clear choice. But if you want to choice one the clear winner is the Garmin vivosmart HR+.